The Custer Institute was founded in 1927 as a local astronomy group by Charles Elmer of the Perkin Elmer Corporation. The group built the Custer Observatory which has become a local historic community resource. 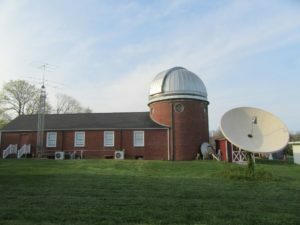 Custer Observatory, the largest and oldest public observatory on Long Island, has unique facilities including a new high-tech Zerochromat telescope, the largest of its kind in the US. Radio Observatory, museum, optical shop, lecture hall, library and cozy meeting room are some of the other features of the facility. Custer is open year round to the public every Saturday night for observing the night sky through its many telescopes. Custer also offers public programs on many Saturday evenings prior to observing. Programs include concerts, lectures, art exhibits, classes, special events and more.